Mermaid I is a modern convenient boat, one of the Mermaid Fleet members, that offer diving in Indonesia. Mermaid I has 8 cabins, to accommodate 15 passengers. There are 2 budget cabins, 4 slightly bigger deluxe rooms and 1 single. Each cabin has air conditioning, private showers, also, a TV and DVD players. In the evening or in between dives Mermaid I guests can rest at the boat's salon. Here they can enjoy a movie or use boat's library with a full range of marine life books. Meals are served at the boat's restaurant. It has big windows with a gorgeous panoramic view. Boat's passengers can try delicious Thai and Indonesian food and also western dishes. To enjoy the breathtaking a view of Mermaid I Liveaboard guests can use one of the two sundecks. Get some tan or relax and read a book on its shaded part. Plus sun decks equipped with several sun loungers. Spacious dive deck of Mermaid I Liveaboard is very spacious, so divers will be comfortable during the preparation for the dive. Also, it is equipped with storage boxes, fresh water shower to rinse after diving. To rinse photo equipment Mermaid I has separate tanks. To ensure safety Mermaid I equipped with first aid kit, life vests, emergency rafts. Crew team of this boat is trained to manage emergency situations. 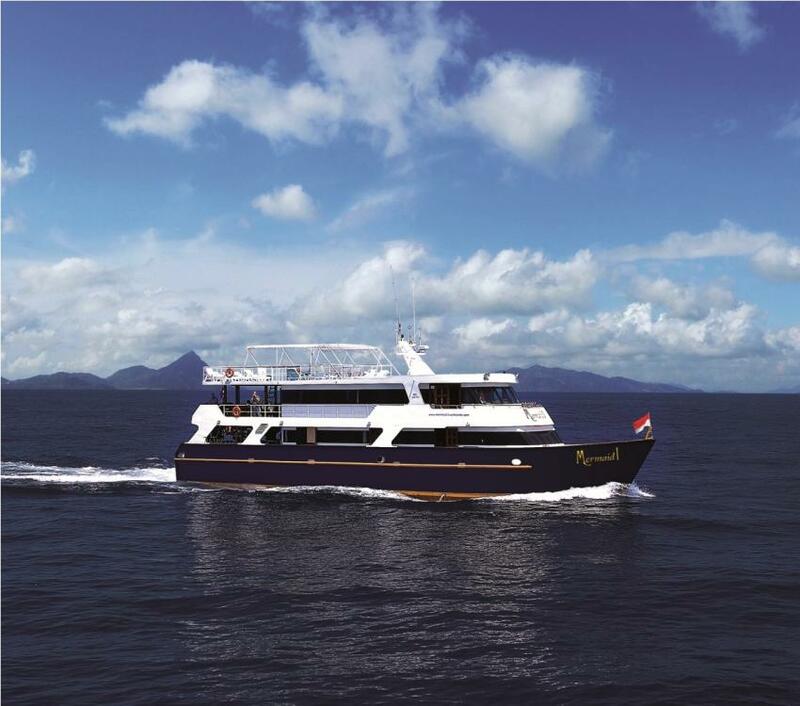 Mermaid I itineraries include diving near Komodo Island, Raja Ampat, and the Banda Sea. Komodo underwater sceneries are colorful and vivid. There are plenty of soft and hard coral on the bottom, walls, and pinnacles. This destination is also famous for macro diving. There is a great opportunity to see nudibranchs, pygmy seahorses. Another famous destination of Indonesia is Raja Ampat. Marine diversity of this area is extraordinary. Many types of corals and fish were discovered here. If you are an experienced diver and had been already too many places, Raja Ampat still won’t leave you indifferent. Diving on the Banda Sea is a chance to meet big and small pelagics. Although Komodo National Park and Raja Ampat can be considered as a year-round destination, there is still a high season for diving in this area. Time from April to August, after the rainy season is the best to dive here. The State Cabin (king sized bed) has ensuite bathrooms, refrigerator and panoramic sea view windows, it is air conditioned, have flatscreen TV and DVD players, bathrobes and toiletries and loads of fluffy towels.